HomeSpec Certified Inspections, Inc. has two state certified Radon testers who work in affiliation with Radalink, the leading Radon testing and analysis company in the country. We provide your testing and Radalink will provide the results and mitigation steps if needed. For pricing and to schedule your radon testing, click here or call us at 941-270-1349. Much of following information has been provided by the EPA. Information regarding the Charlotte and Sarasota counties has also been included. More information about radon can be found by visiting the EPA’s radon site at http://www.epa.gov/radon/. Radon is a cancer causing, radioactive gas. It comes from a natural breakdown of uranium in the soil, rock and water and gets into the air you breathe. Radon typically moves up through the ground to the air above and into your home through cracks, expansion joints and other holes in the foundation. Is Radon a concern in Charlotte and Sarasota counties here in SW Florida? Yes. Based on the current models reviewed at the Florida Health and Safety websites as well as the Federal Radon maps Charlotte and Sarasota counties currently come back as showing up to 40% of current tests come back over the recommended radon levels in the home. How can my Charlotte county or Sarasota county home have Radon? My neighbor claims they have no issue. Radon levels can change from house to house and neighborhood to neighborhood. I have never heard of radon. Is it really that dangerous? Radon is regarded as a Group A carcinogen; that is, it is known to cause cancer in humans with prolonged exposure. It has been shown in carefully controlled studies on animals, and on hard-rock miners, and most recently confirmed in residential case-control studies, that the effects of radon gas can significantly increase the potential of lung cancer. The United States Environmental Protection Agency and Surgeon General recommend that people not have long-term exposures in excess of 4.0 pico Curies per liter (pCi/L). 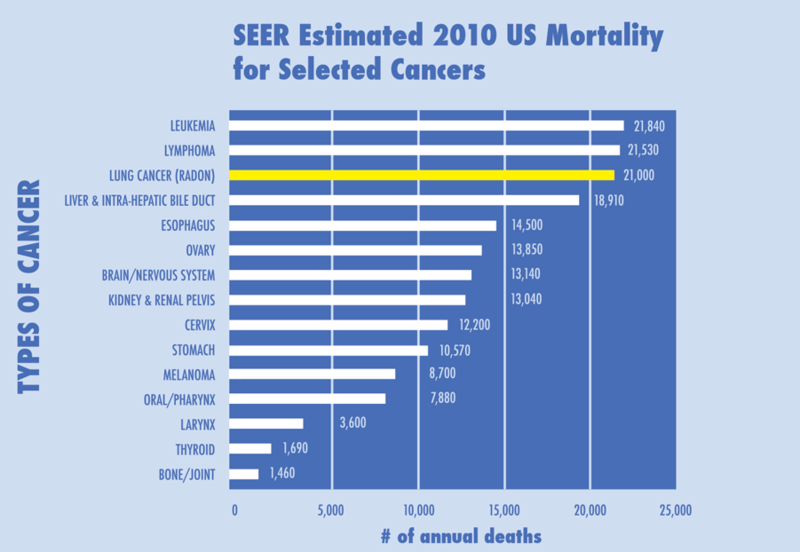 The EPA estimates that radon causes thousands of cancer deaths in the U.S. each year. Radon is estimated to cause about 21,000 lung cancer deaths per year, according to EPA?s 2003 Assessment of Risks from Radon in Homes (EPA 402-R-03-003). The number of deaths from other causes are taken from the Centers for Disease Control and Preventions 1999-2001 National Center Injury Prevention and Control Report and 2002 National Safety Council Reports. Nearly one out of every 15 homes in the United States is estimated to have an elevated radon level (4pCi/L or more). Levels in Charlotte county average over 40% of the homes tested exceed recommended safe levels. Elevated levels of radon gas have been found in homes in Florida. Contact the Florida radon office for more information about radon in your area, http://fl-radon.info/. The EPA recommends fixing your home if the results of one long-term test or the average of two short-term tests show radon levels of 4pCi/L or higher. 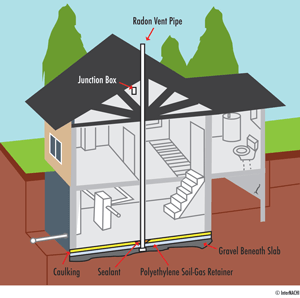 With today’s technology, radon levels in most homes can be reduced to 2 pCi/L or below. You may also want to consider fixing if the level is between 2 and 4 pCi/L. Where can I get a radon test? The most common type of radon testing devices are passive devices. Passive radon testing devices do not need power to function. These include short term devices such as charcoal canisters and long term devices such as alpha-track detectors. Both short and long term testing devices are generally inexpensive. A short-term test remains in your home for 2 days to 90 days, whereas a long-term test remains in your home for more than 90 days. All radon tests should be taken for a minimum of 48 hours. A short-term test will yield faster results, but a long-term test will give a better understanding of your home’s year-round average radon level. Types of Tests: The type of test you deploy may depend on the ultimate objective of the occupant. A short term test will provide information about the potential for radon in a home. A long term test is better able to predict the risk of exposure over a longer period of time. A long term test will provide results with a big picture risk of exposure over a longer period of time factoring in many conditions that can impact your actual test result such as wind events, air temperatures, winter conditions and open windows. I’m selling a home. What should I do? The EPA recommends that you test your home before putting it on the market and, if necessary, lower your radon levels. Contact HomeSpec to schedule your testing prior to selling your home. Save the test results and all information you have about steps that were taken to fix any problems. This could be a positive selling point. A potential buyer may ask for a new test, especially if: 1) The last test is not recent, e.g. 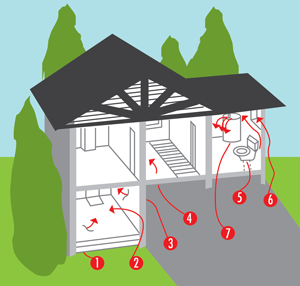 within two years; 2) You have renovated or altered your home since you tested; or 3) The buyer plans to live in a lower level of the house than was tested, such as a basement suitable for occupancy but not currently lived in; 4) State or local government requires disclosure of radon information to buyers. If I find a home with a radon problem, should I look for another home? If a properly performed test indicates an elevated level of radon in the home you wish to purchase, it is highly possible other homes in the same area will have elevated radon. So, if you like the house, consider taking a reasoned approach that will confirm levels and reduce the radon. Perhaps the best news about radon is that radon can be reduced, either before you buy the home, or after you buy it and move in. Caution to buyer: If you want to insure that the radon mitigation system is installed to your standards you may consider overseeing the work yourself. A Seller would have incentive to look closer at cost than quality and in certain situations may make decisions that would differ from your decision. As part of the home inspection process, request a short-term radon test, using a qualified radon measurement professional. Your home inspector may or may not be qualified to conduct radon testing. If the short-term test result is 4.0 pCi/L or higher, then consider asking the seller to fix it, or consider purchasing the home and performing a long-term test to determine what the actual exposure is. Once you decide to reduce the radon in the house, seek bids from qualified contractors who are willing to guarantee and warranty results. Use bids from contractors to either fix the home prior to moving in, or after you take possession. Bids can be used as a basis for negotiations or even establishing escrow funds that can be used to mitigate the house once elevated levels have been confirmed. Of all the problems a house may have, radon is one of the easiest to identify and fix! The EPA recommends that you know what the indoor radon level is in any home you consider buying. Ask the seller for any and all previous radon test results. If no test has been performed contact HomeSpec at 941-270-1349 or info@homespecfl.com to arrange to have the home tested. Those tests will be sent to RADALINK to be interpreted and a detailed report will be sent to you from RADALINK. HomeSpec Certified Inspections, Inc. is an affiliate of RADALINK and is licensed to perform testing only. What, if any, structural changes, alterations, or changes in the heating, ventilation, and air conditioning (HVAC) system have been made to the house since the test was done. Such changes might affect radon levels. If you accept the sellers test, make sure that the test followed the EPA and test manufacturers recommended protocol for deploying the test. I’m buying or building a new home. Are there advantages to installing a system during construction? Most Effective System: Installing a system during construction is the most effective way to reduce radon within the structure. Installation at this point allows the mitigator the opportunity to be part of the construction process. At pre-designated intervals the mitigator will incorporate all aspects of an ideal system. Aesthetic Benefits: Plumbing and fan units can be incorporated as part of the structure and hidden. Make Upgrading Easy: Installing them at the time of construction makes it easier to reduce radon levels. Moisture and other Gases: The radon-resistant techniques may also help to lower moisture levels and reduce other soil gases. Energy Efficiency: When installed properly and completely, radon resistant techniques can also make your home more energy efficient and help you save on your energy costs. How do I treat radon and how long will it take? Radon is mitigated by installing a system that will draw the radon-laden soil gas from beneath the foundation and exhaust it outside of the building, far enough away from windows and other openings that it will not reenter. A reduction system typically consists of a plastic pipe connected to the soil either through a hole in a slab, via a sump lid connection, or access beneath a plastic sheet in a crawl space. Attached to the pipe is a quiet, continuously operating fan that discharges the radon outdoors. How this is done is a function of the construction of the home, rather than the radon concentrations that exist. A home with more than one foundation can presents challenges to collecting the soil gas from under all portions of the building. However, talented mitigation contractors typically can connect multiple systems together so that only one fan system is required. Crawlspace foundations can be costlier, since the contractor needs to install a high density plastic sheet over the soil and sealed to the walls and then route the piping to the fan. However, the added benefit of reducing moisture in the crawlspace, in addition to reducing radon, can be a real plus. The house we’re looking to purchase already has a radon system installed. Do we need to check the radon levels? Yes. Not all systems are installed properly or succeed in lowering the radon levels sufficiently. Only testing will tell you whether the system that is already installed is effective in lowering the radon levels.